Marge Perry, Master Hypnotist, and Master Hypnotist Society Certified Trainer, reveals how hypnosis is for everyone. A preponderance of social proof, academic studies, public acceptance and user results prove beyond reasonable doubt… HYPNOSIS WORKS! Modern day methods and applications of hypnosis have made hypnosis a trusted and valued member of the healing arts, social sciences and human services. Old-time myths and misconceptions about hypnosis have given way to responsible, professional uses that have been of major benefit to thousands of people for many years. Hypnosis has applications in medicine, dentistry, psychology, obstetrics, counseling, law enforcement, habit management — in fact, in every area of the healing arts, education and self-improvement. Hypnosis is now being taught at major universities and learning institutions across the United States. Hypnosis is an ability we all possess. Hypnosis expands your ability to think critically and control your thoughts. The result is obvious. Change your mind and change your life. Change your thoughts and you change behavior. Change your unwanted behavior and improve your life. Thinking is a magical ability. Unfortunately, most people allow life's challenges, problems and immediate stressors to dictate what and how they think and how they perceive the world around them. These false perceptions create harmful thoughts that keep us enslaved by unwanted behavior and unnecessary habits. 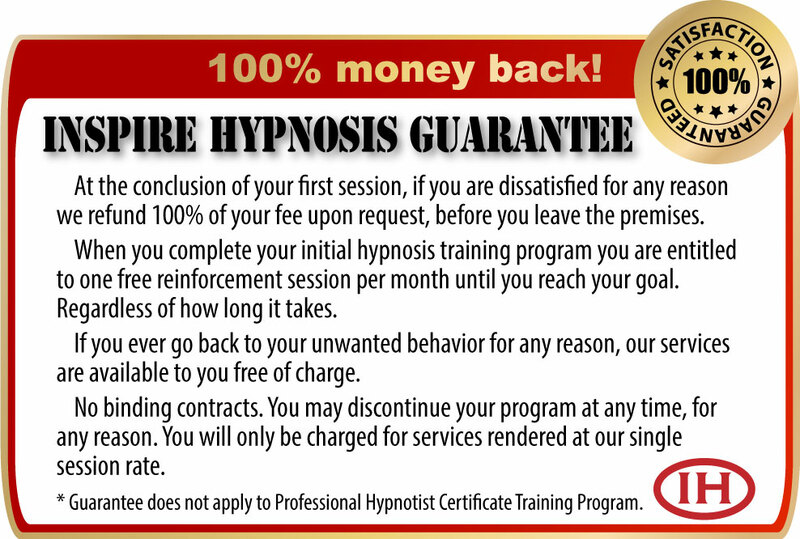 I have witnessed results and outcomes achieved with hypnosis that defy human belief. Hypnosis can equalize, neutralize and in many cases, completely eliminate unwanted behavior more quickly and inexpensively than once thought possible. Hypnosis is a shortcut to optimal living. Combine a motivated, reasonably intelligent person plus hypnosis — and the results are usually impressive. This web site is designed to acquaint you with hypnosis and answer questions you may be asking about Inspire Hypnosis' educational services. Thanks for visiting.